A method for regenerating whole plants from nodal (axillary bud) cultures of seedlings was developed for flowering dogwood (Cornus florida L.). The seed source significantly influenced the rate of proliferation, although cultures initiated from each of the seven mother trees produced some shoots. Woody plant medium (WPM) was superior to either Murashige and Skoog or Schenk and Hildebrandt basal medium. 6-Benzyladenine (BA) at 2.2 or 4.4 μm stimulated the generation of significantly more useable shoots (≥1 cm) compared to all other concentrations (0.5–22.5 μm tested. Thidiazuron (TDZ) at 0.6 and 1.1 μm supported proliferation, but strongly inhibited shoot elongation. 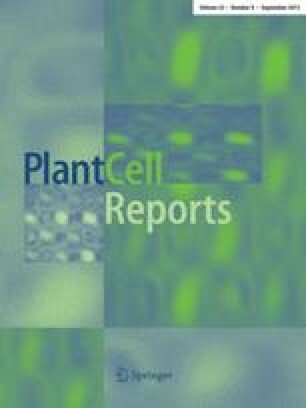 TDZ initiated cultures transferred to medium containing 4.4 μm BA produced usable shoots after five additional subcultures. Shoots generated adventitious roots when exposed to either a 12-h pulse of relatively high concentrations (246–1230 μm or continuous lower concentrations (0.5–49.0 μm of indolebutyric acid (IBA) for longer periods. Microshoots produced the significantly greatest number of roots when subjected to 4.9 μm IBA in WPM over a 4-week period. Whole plants were acclimatized to the laboratory conditions and subsequently to the greenhouse. The methodology described here should be useful in a breeding program by supplying multiple copies of unique, recombinant genotypes.